These past few weeks of the protest brought about massive chaos all over the country. The operation against the protesters at Faizabad resulted in an output, completely opposite to what the government had planned. The situation grew so bad that the police and army had to be summoned. The house of two federal ministers was attacked as well. At first, while following the directions of the COAS, the sit-in was handled peacefully by the government, but then the situation worsened. 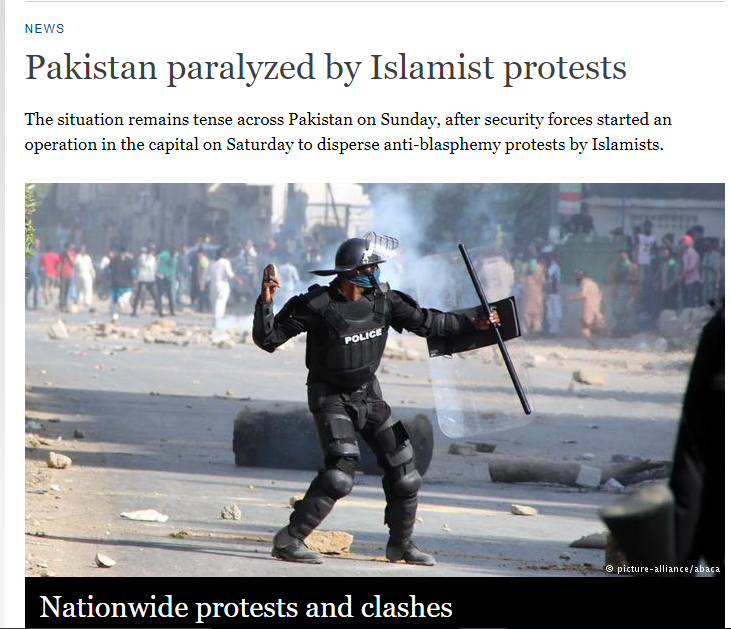 The crackdown wasn’t well received by the religious party protesting in Islamabad. Soon after, many new protesters were seen in the federal capital and other major cities. The entire country was literally shut down for several hours. 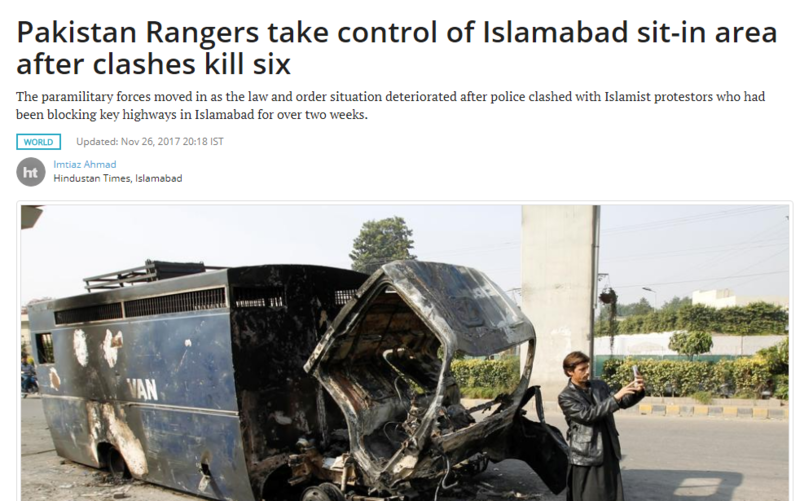 “The Pakistan Rangers took control of the area occupied by anti-blasphemy protesters in Islamabad on Sunday while police and the Frontier Corps personnel were deployed in other parts of the city, Radio Pakistan reported, as peace gradually returned to the capital and other cities after a day of violent clashes left at least six people dead. “The situation in Islamabad had been simmering for three weeks before it erupted into violence on Saturday. “Many blame the government for allowing the protesters to grow in number and build a countrywide momentum for their movement. “When the authorities moved, they did not appear to have a good plan. The police failed to arrest leaders of the protest, and when the trouble started to spill into other cities, they resorted to a controversial policy of blocking all live news channels and social media websites. 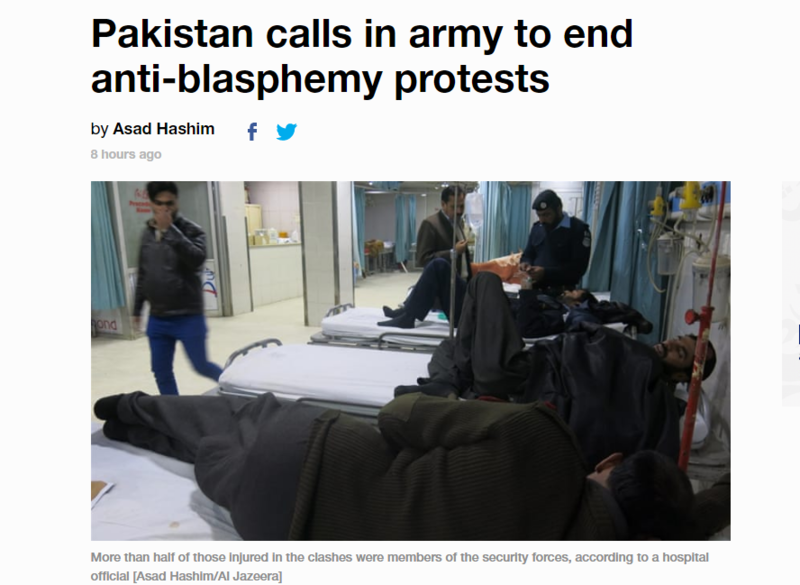 “The Pakistani army has been called in to restore order to the capital after clashes between anti-blasphemy protesters and police left at least 174 people injured. Thousands of riot police and paramilitary personnel on Saturday fired tear gas, rubber bullets and water cannon at the protesters in an attempt to dislodge them from a major highway into Islamabad. “There have been several fatalities and scores of people have been injured in clashes between the protesters and security forces in Islamabad on Saturday. In the southern city Karachi at least 27 people were injured in clashes. Protests also led to the closure of the main road in Lahore. The developments have paralyzed everyday life major cities with violence erupting in 9 cities across the country. 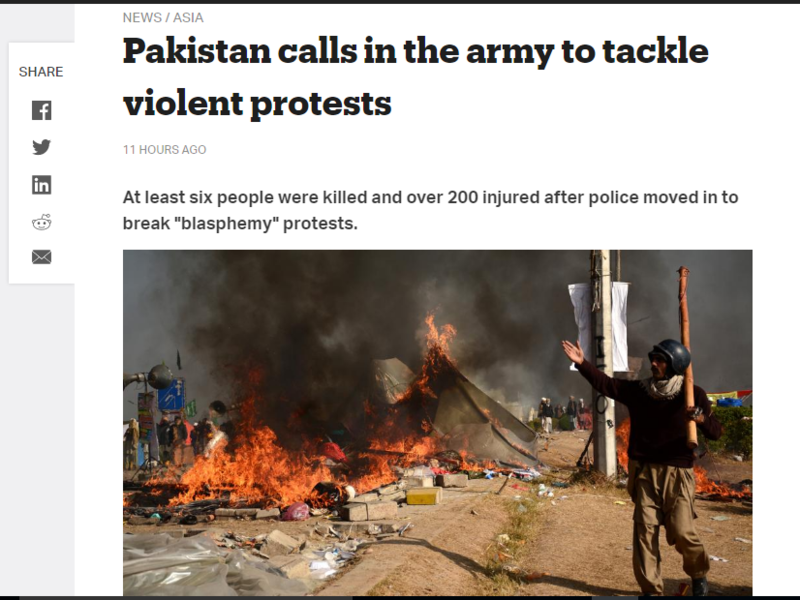 “Pakistan’s Law Minister Zahid Hamid apologized to protesters Sunday for provoking outrage and he assured the nation he believes in the finality of the Prophet Muhammad. 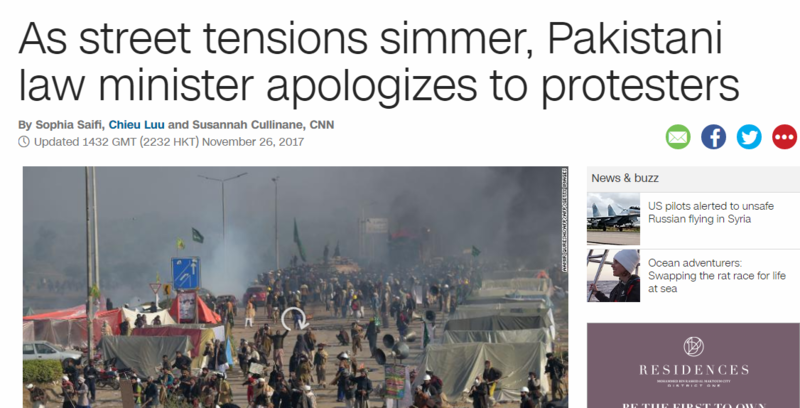 The apology came as Pakistani forces moved against protesters blocking a key road in the capital Sunday after demonstrators attacked a police checkpoint, state media reported. The Pakistan Rangers have taken a position close to the Faizabad sit-in in Islamabad after protesters set ablaze a car and four motorbikes, witnesses said. The Rangers are an armed paramilitary force under the command of Pakistan’s military. 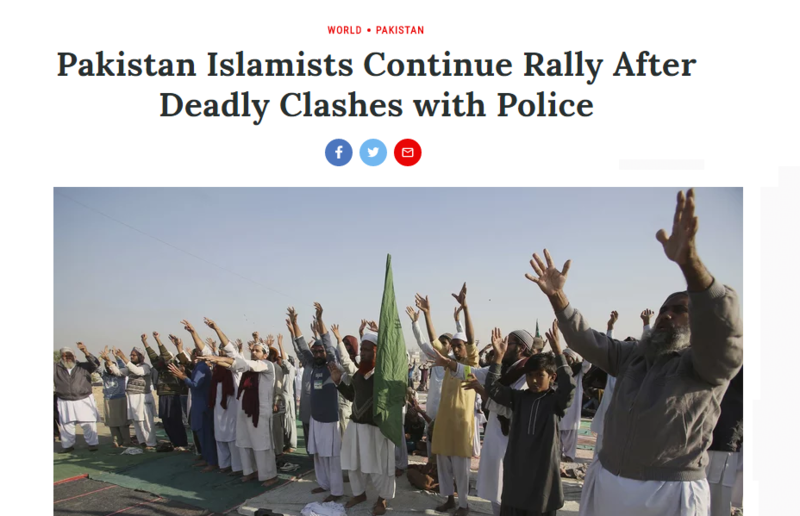 “Pakistani Islamists pressed ahead with their rally near Islamabad in even larger numbers on Sunday, a day after clashes with police left six dead and dozens wounded. On Saturday, security forces failed to disperse the protesters when riot police moved in with tear gas and batons. Hospital officials said nearly 200 people were hurt, most of them policemen. 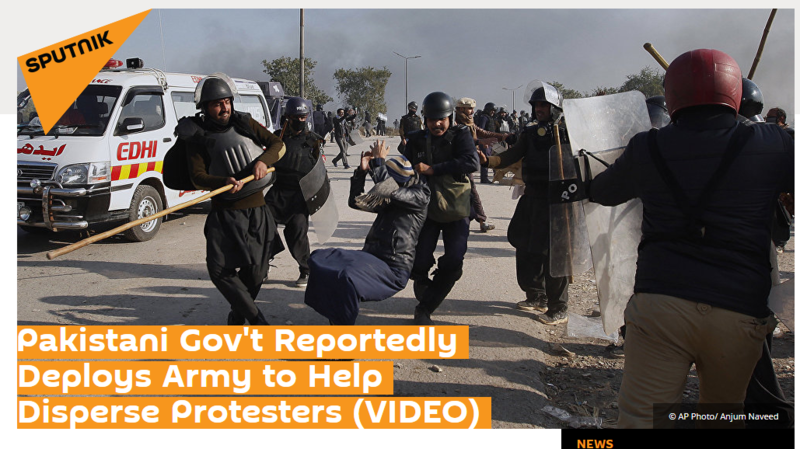 They confirmed six people were killed in clashes with police at the Islamabad rally. 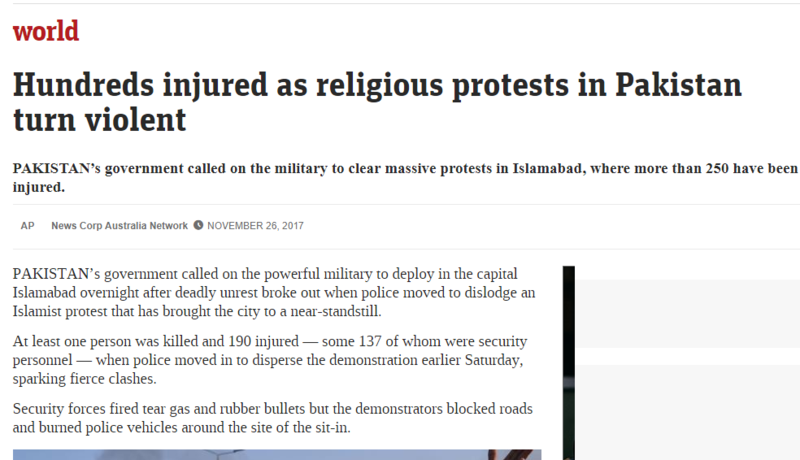 “At least 200 people have reportedly been injured and a police officer has died as a result of clashes between protesters and security forces in the Pakistani capital as security forces launched an operation to clear an almost three weeks long sit-in by religious groups. “Pakistan’s government has called in the army to help police and paramilitary forces disperse a protest in Islamabad that killed at least six people and injured 200 more on Saturday. With the situation turning grim in Islamabad and violence spilling into other cities, the government’s Interior Ministry issued a statement in the evening saying the army has been deployed to “control the law-and-order situation. “Pakistan’s government called on the powerful military to deploy in the capital Islamabad overnight after deadly unrest broke out when police moved to dislodge an Islamist protest that has brought the city to a near-standstill. At least one person was killed and 190 injured — some 137 of whom were security personnel — when police moved in to disperse the demonstration earlier Saturday, sparking fierce clashes. 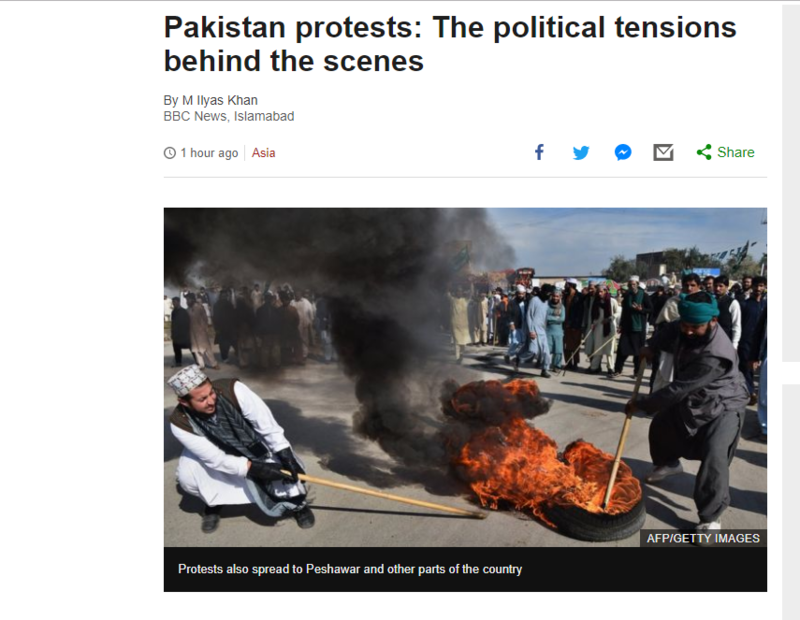 “After nearly three weeks of simmering tensions, a 20-day protest finally erupted in violence in the Pakistani capital of Islamabad. Led by Tehreek-e-Labaik Ya Rasool Allah (TLY), protesters blockaded the Faizabad Interchange and demanded the sacking of law minister Zaid Hamid amid accusations of blasphemy. In the ensuing clashes, at least six people have died, 200 have been injured and the government has called in for reinforcements from the army. It is yet another example of how Islamist groups in Pakistan are now bent on exploiting the sectarian fault lines that have existed in the country for a long time for their own political gain. “The PCB has decided to postpone the semi-finals and final of the National T20 Cup because of the “prevailing situation” of religious unrest in Pakistan, saying new dates would be announced later. The next round of the Quaid-e-Azam trophy has also been called off. People of Taif stoned the Holy Prophet and bleed him but He did not replied back and ultimately everyone there became muslims. We, here, kill muslims burn their properties block roads and supplies in the name of Prophet…. and we still believe non-believers will turn to Islam happily! I have read a hadith stating that people should not sit in the bazars if they need to do so then care must be taken to not to create problems for passerby. How do our Ulema block roads… and may Allah forgive us for hearing extremely low grade words used by Labbaik party leader. dirty words used by the party. Who used dirty words are not Muslim. These deobandi and brelvi are created by British Monarchy to further their agenda. Deobandi and brelvi are political movements. Don’t get manipulate by him. He is a known liberal fascist. He supports qadiyani. He is just playing with words. He also hide his old comments so u don’t know his real face. These qadiyanis are behind these amendments. check this program of Orya Saheb on utube. Why did you hide your old comments, why not show them and make your profile public? are you afraid that people will know your real face that you are a liberal fascist and playing with words here. I don’t have direct Disqus ID and is connected through social media ID. People should not visit bazaar unnecessarily as it is the place which Allah does not like but for the right cause there is a word Jihaad as well. Do read the details of “Jihaad”. Being a normal Human, no one is clean but at least never support the people who talk against Iman. Jihaad doesn’t only mean WAR. I am not an islamic scholar but I try to read and learn myself and often my point of view differs from most of religious persons around me. Islamic scholars emphasize on “maswaak” but i take it as indication of “act of cleanliness” just like molvis does not fight jihad by talwaar as was done by Holy Prophet and take it as the indication to use modern available warfare. Islam asks for increase of population but for me it was the requirement of that era when muslims were in low number. At this age we need quality muslims, not the quantity. Muslims today are eager for jihad but remember our Prophet made peace through Hudybia accord because muslims were weak and need time to gain power although most of the agreement was in favor of non muslims. We should also do the same and make peace with others (India, Afghanistan, Iran even Israel) and try to achieve economic progress first (take China as example). These are my understandings and I may be wrong. However I would request everyone to use their own mind and self reading of Islamic Books preferably Holy Quran. For me Islam is a religion of peace and harmony and asks us to be example for non muslims but er today are presenting Islam as a horror. Or khatam e nabouwat k lie jo ap ni kea, wo bara acha tha. Bahot acha message ap ni world ko dea. Muslim ki thori respect or bhara di. Yahi mentality chahie. Another chapter in Pakistan Studies.. So called Muslims who do bad things in the name of ISLAM are not Muslims. In Pakistan there will be hardly 10pc Muslims, rest are just pretenders.